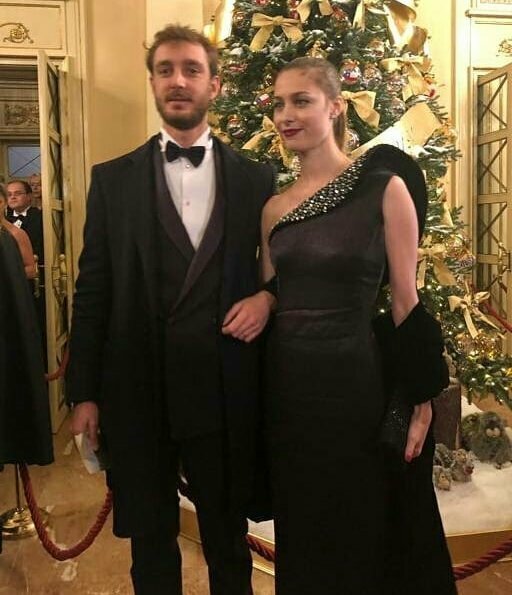 On December 7, 2018, Pierre Casiraghi and Beatrice Borromeo Casiraghi attended the opening of 2018/19 season of La Scala (Teatro all Scala) in Milan, Italy. La Scala opened the season with the concert "The return of Verdi’s Attila" conducted by Riccardo Chailly. (Beatrice wore an embellished one shoulder Giorgio Armani Prive gown). They are a striking couple. Beatrice looks lovely. Have to say I don't love her sister's dress. @Franny, 'Striking Couple'? Really?? With Pierres ill-fitting suit and coat and sloping bow-tie? Not even talking about the untidy beard, that thankfully is going out of fashion. Beatrice's dress is okay, but something ist terribly wrong with her hair and make-up. Striking couple? Not! Yes. They are absolutely a striking couple. But 1990 called and wants "not!" back. ;0) I hope you're right about beards though. This isn't the best thing BB has ever worn, but it's still better than most of us look. I like the fact that this entire extended Grimaldi family doesn't freak out about clothes or being Princessy. Some people think the Casiragis "always frown" but I think they just look that way when they have to do the whole "gather at the balcony" thing. They all love and support one another. Beatrice and Charlotte have such a warm relationship, no one is guessing if there is a "rivalry" , like in other royal/princely families. I love the Duchess of Cambridge and pretty much all of the BRF more than my fave shoes, but it would be way more fun to be part of this family! Agree, Franny. A stunningly beautiful couple. The dress is muy elegante without being overly styled. Just enough interest with the glittering sweep up to the left side of the face, balanced by the sweep of her hair around the right side of her face. Gorgeous. Yes, Beth, I think they are striking couple - nothing to do with fashion, I think they have a presence. And I think Pierre looks fine crooked tie notwithstanding. I don't like PIC1, was that a game? Pierre used to look better in my view. Beatrice is fine, although she has already been better dressed. Aww, I wish her hair would have been a bit nicer—even just a more elaborate ponytail. She looks lovely nonetheless. Wow , Beatrice looks stunning . A truly handsome young couple , enjoy. Beatrice is so beautiful. A true classic beauty. Beatrice is very beautiful. In this wonderful gown she looks elegant and modern at the same time. Great couple! Elegant and a beautiful silhouette. Nice dress, she is really pretty. I only would have changed the ponytail into a nice updo. Béatrice est une femme magnifique ! Generally I love her style, not today, I don't think it's horrible, but somehow it misses the mark for me, it looks very mermaid like, and a little shiny. If I could have anyone's wardrobe, it would be Beatrice! I do like her better in lighter colors, but the lady knows how to dress. And somehow she can look great in shorts and a t-shirt too. What's the deal with beards? Eek, my brother has one now too, I miss his face. But Pierre looks much better than when all the men in Monaco grew mustaches! :0) Siiiigh, they are the best looking couple. Ah ah interesting question, Amy : Whose wardrobe would you like to have? For me one easy answer : not Maria Olympia's of Greece (now a fashion model) not Queen Elisabeth's!!... easier to exclude than select. Those two are extreme in age categories, not easy.